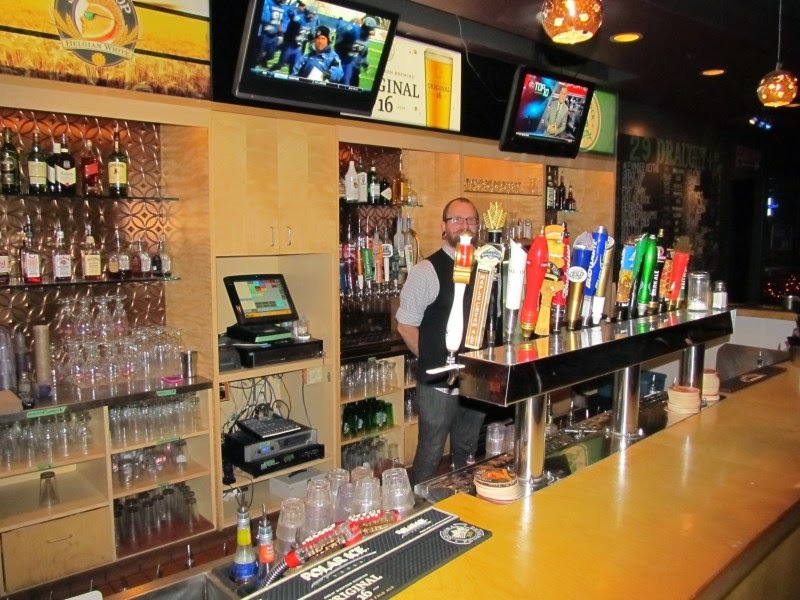 Jekyll and Hyde's, the latest in the lineage of restaurants at the corner of 437 Stradbrook and Osborne, features a winning combination of food and fun. Brian Allison created Cheer to celebrate the return of the Jets, but found the hockey rink sized space a little unwieldy. In April 2014 Brian split the room in half with Jekyll presiding over the cuisine on one side, and Hyde carousing on the other. 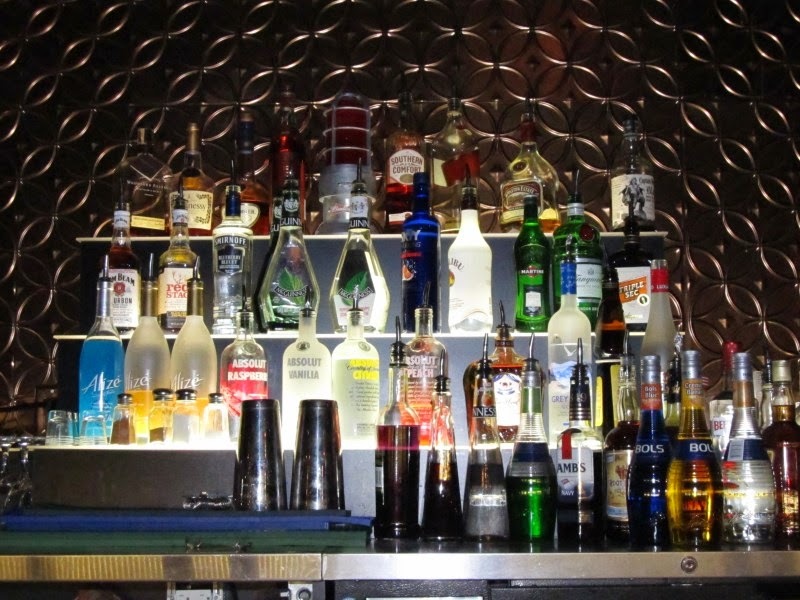 In the summer Jekyll & Hyde’s boasts a large patio at the corner of Stradbrook and Osborne. It’s possibly the only restaurant in Osborne Village that has parking. Brian’s a character who signs his email “Life Coach” and business card “Man About Town”. He gave me a rapid fire tour intermingled with chatter about needing to go rescue his wife whose car needed a boost. It was Comedy night at Hyde’s and Brian was preparing for a full house. The event side has a good sized stage, booths along one wall and tall tables and chairs in the centre. The “green room” next to the stage had the curtain pulled back revealing comfy couches for lucky patrons. 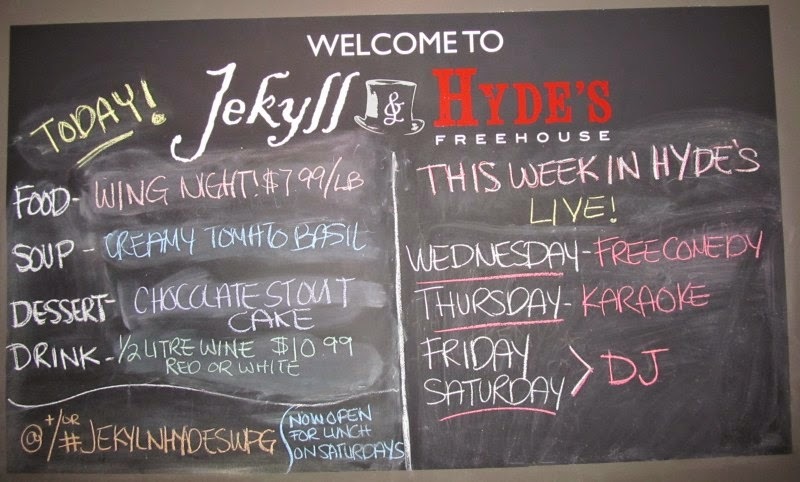 Hyde’s has its own beautiful bar and a few pool tables used by the Wednesday night league. The restaurant is high ceilinged and roomy with comfortable pleated booths and low tables in earthy tones. 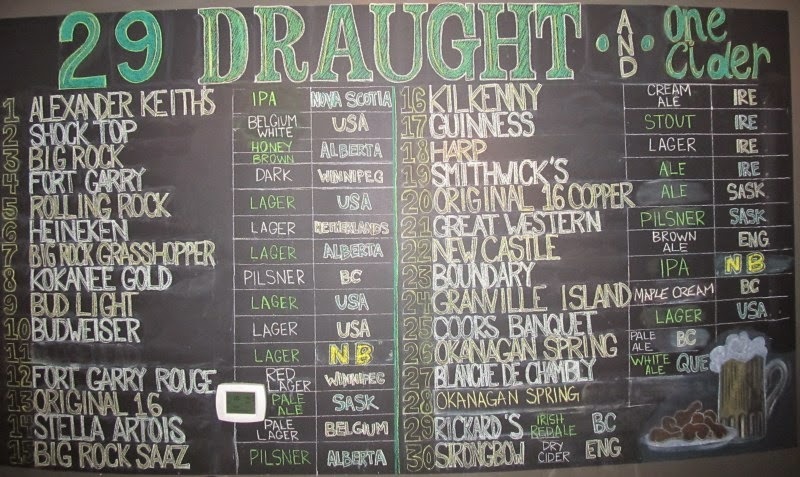 The crowning bar has 29 draughts on tap – including 3 Half Pints varieties – and 1 cider. 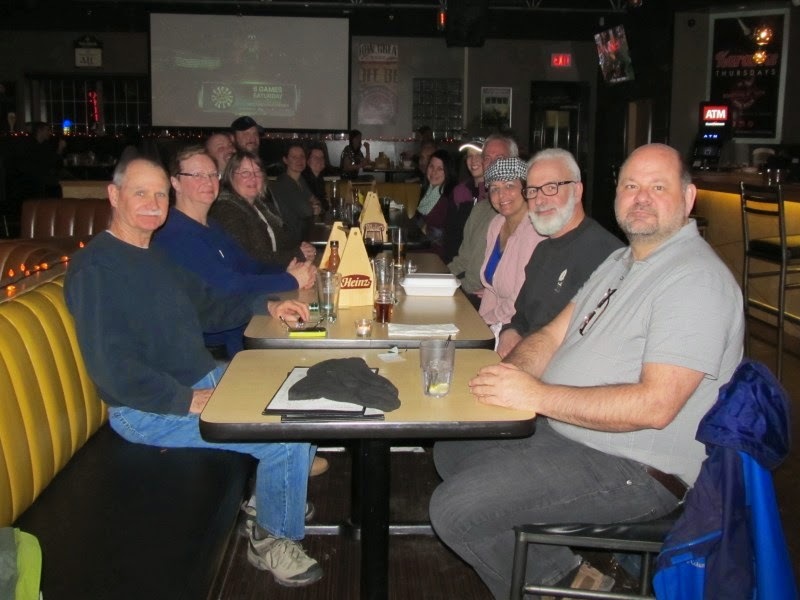 There was a large screen at one end playing the Jets game, which was great for hockey fans, and the volume wasn’t obtrusive for those enjoying food and conversation. They were ready and had us set up conveniently close to the bar. Our server Kelly was attentive and personable – she managed our group of 15 handily and was quick to take drink orders from new arrivals with the resulting libations arriving fast. 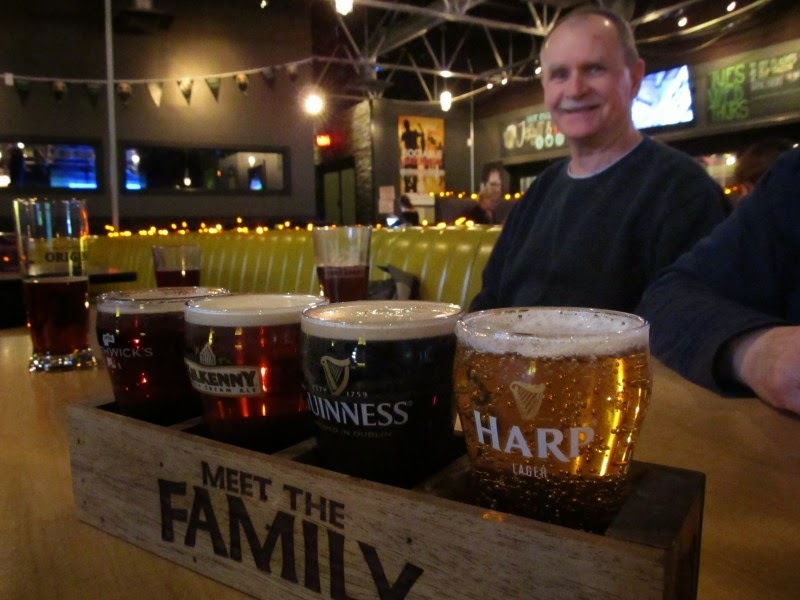 Flights of beer were delivered in “Meet the Family” boxes. 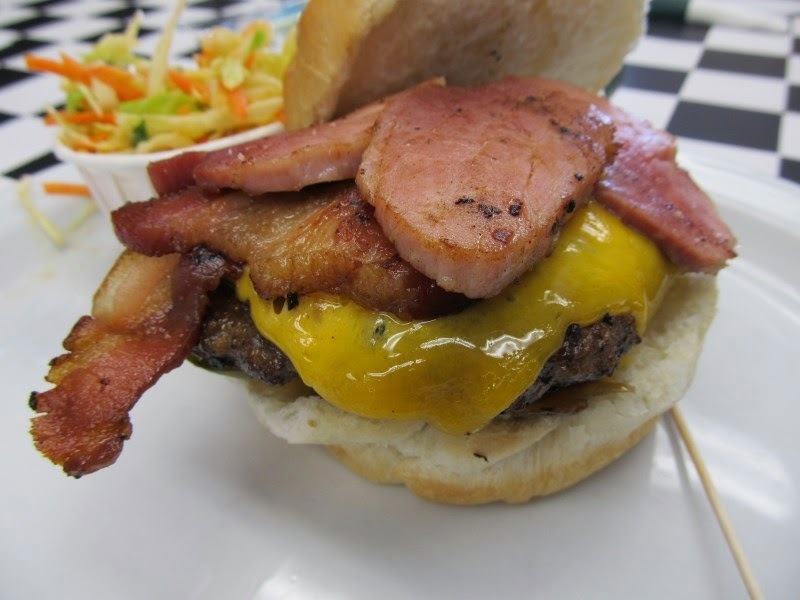 There are three beef burgers on the menu: The Classic Jekyll with chipotle mayo and Jekyll’s BBQ sauce, The Holy Jalapeno Popper that adds cream cheese and tempura jalapenos, and the Bacon and Blue that piles on maple bacon and blue cheese. 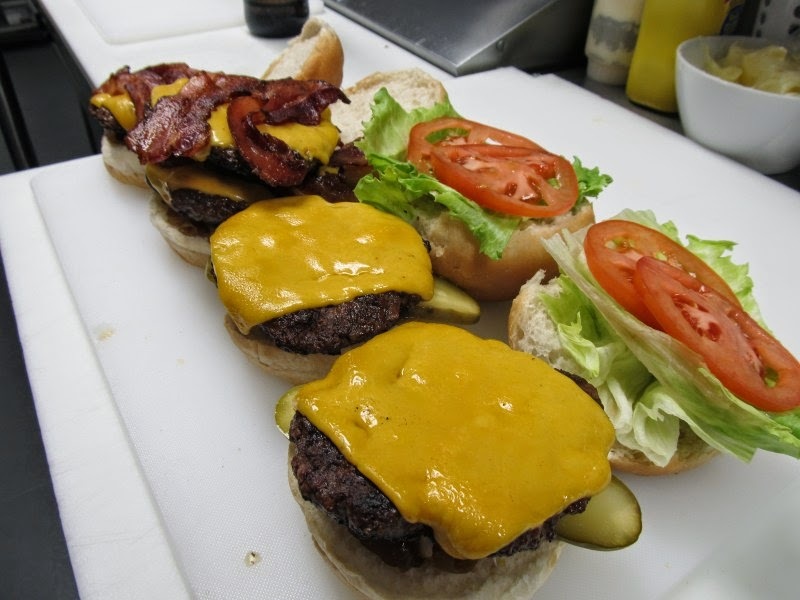 The burgers all come with two sides, but on Jets game days, the special is a burger, one side and a beer. During a break from the mayhem in the kitchen, Chef Scott came to see how we were enjoying our burgers and told us how they hand build the 5.5 oz patties from Angus beef with 19% fat and no fillers. That was just the right amount of fat to make it moist, delicious and nicely crusted from the grill. It was a good sized patty with a slightly oversized bun and the BBQ sauce on the bottom added some zing and moisture. I opted for the bacon and blue cheese and it was delicious. 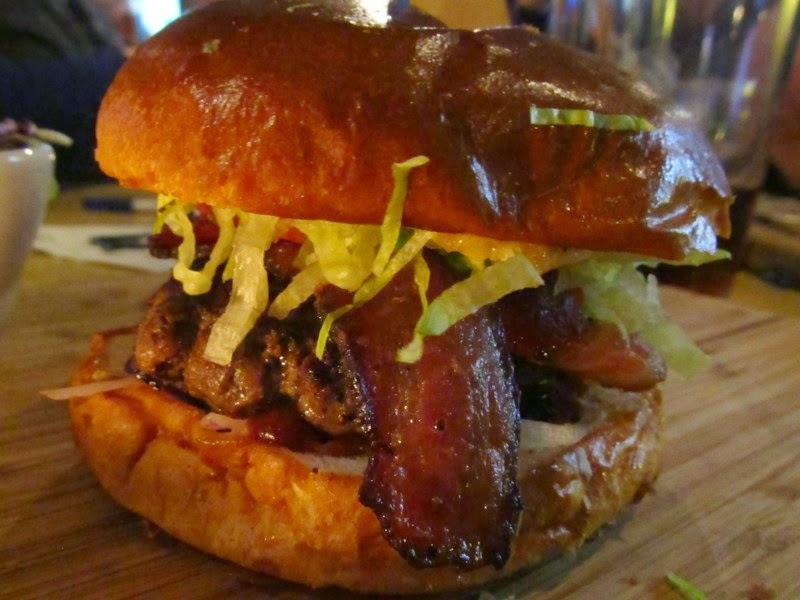 Jekyll and Hyde’s bakes the bacon with a maple syrup drizzle adding a little sweetness and texture. There was just the right amount of blue cheese on my assembly. Enough so I could savor it, but not so much that it tipped the flavour balance. There was plenty of shredded lettuce but the tomatoes were a little scarce. They’re hard to grow in a Winnipeg winter. 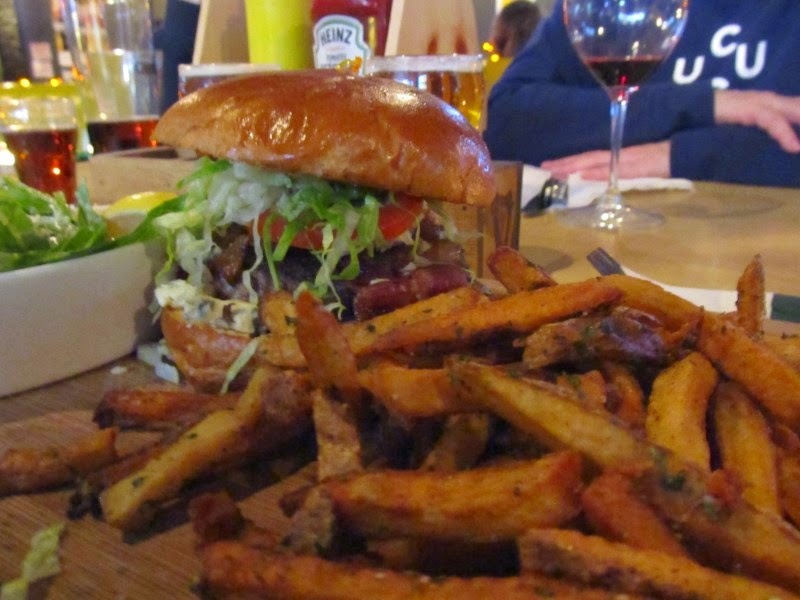 Karen had the Holy Jalapeno Popper: “I really liked the flavour, texture and, oh, the bun! 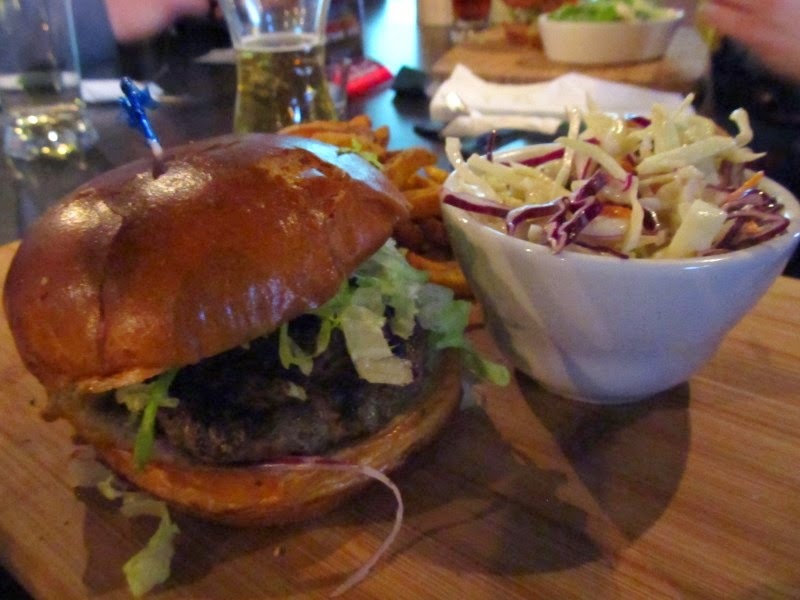 Especially the bun; soft and warm, it fit snugly holding all the toppings against the burger. The sauce on the burger was terrific - jalapeño spice not too spicy.“ Jessica modified hers and scribbled “Shiny bun, good burger, moist. Needed the cheese to cut the tang of the jalapeño. Ordered with no cheese.” Don’t mess with Chef’s design! We were pleasantly surprised when the bills came and April called Kelly over to make sure they were correct. 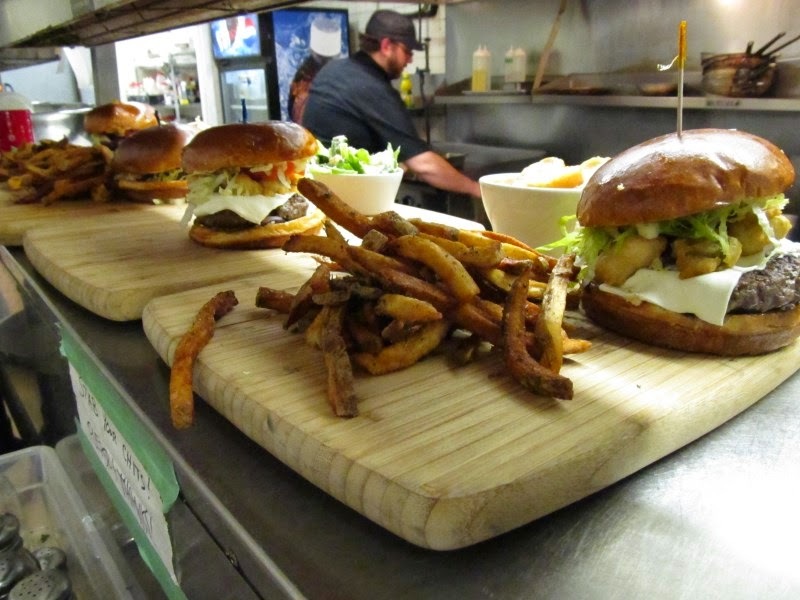 As we’d arrived during happy hour (4-7) on a Jets night, the burgers with a side and draught were all $12.99. The additional beers were only $4.75 (tax inc.) Great deal! It’s been said that Winnipeg has only 2 degrees of separation. I’d barely started introductions when Geoff, Jessica and Julian realized they’d had lunch together in Montreal 7 years ago. “Oh hey Nicole!” exclaimed Jessica as she spotted her IQ’s co-worker from years ago arriving. Small world. Smaller Winnipeg. Here’s a little contest to earn the respect and admiration of your peers: see if you can list all the incarnations at this location since the Beefeater. 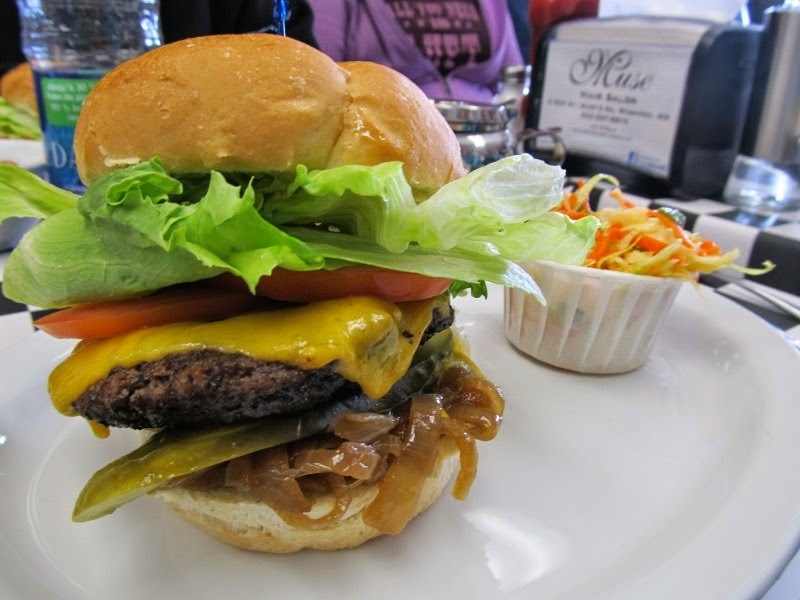 Mark's the Spot is a cheery old school diner where you can enjoy a delicious home style cheeseburger for under $6. 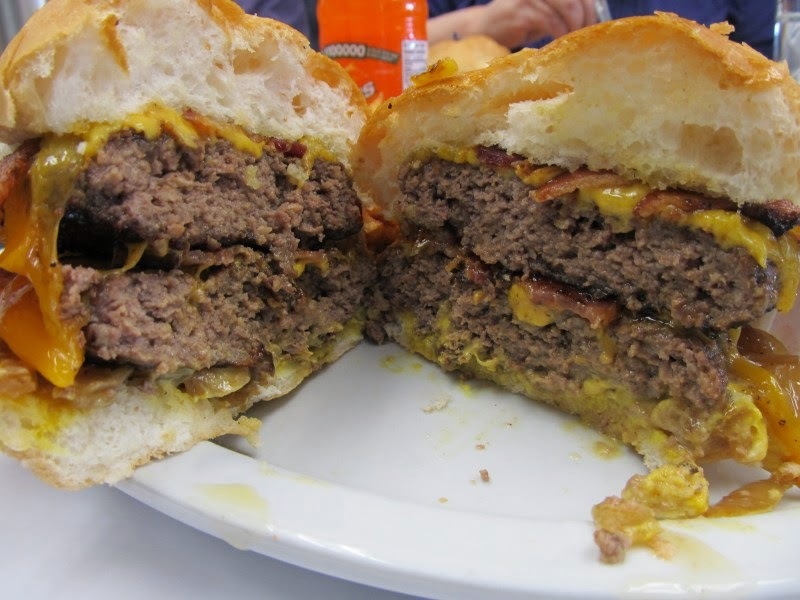 A 5-Star burger according to Burger Club! 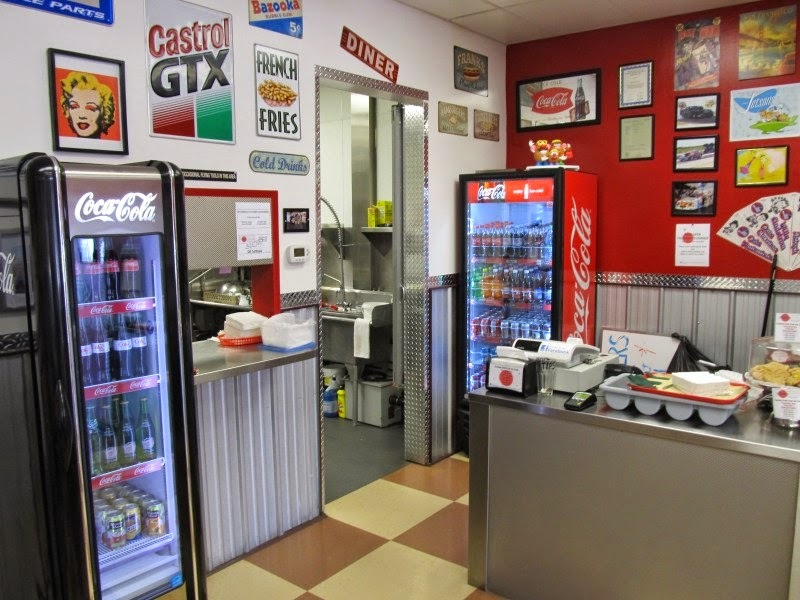 It’s a little off the beaten path at 405 Turenne St. in the St Boniface Industrial Park, but well worth seeking out for breakfast or lunch – and now Thursday supper as well. 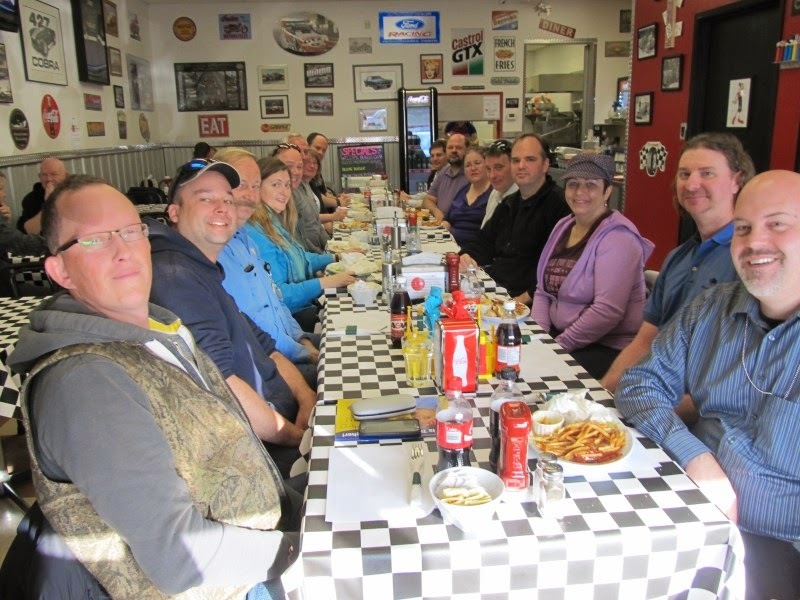 Judging by all the regulars, locals quickly embraced the friendly little diner Mark Gawthrop opened in May. It feels very welcoming as you pass through the door and are immersed in memorabilia. Mark's racing roots are evident from the photos, slot-car track and diamond plate trim. 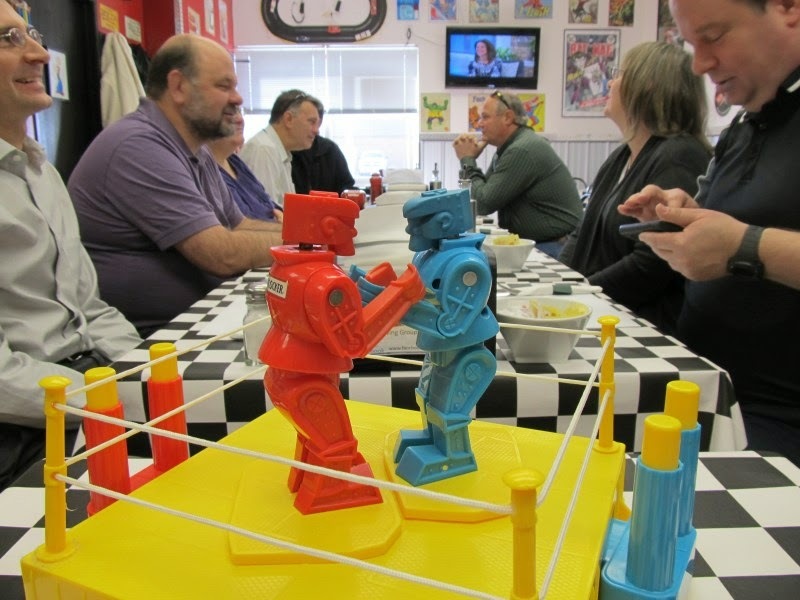 There’s a Rock 'em Sock 'em Robot on the table and the walls are covered with classic games and cartoons. 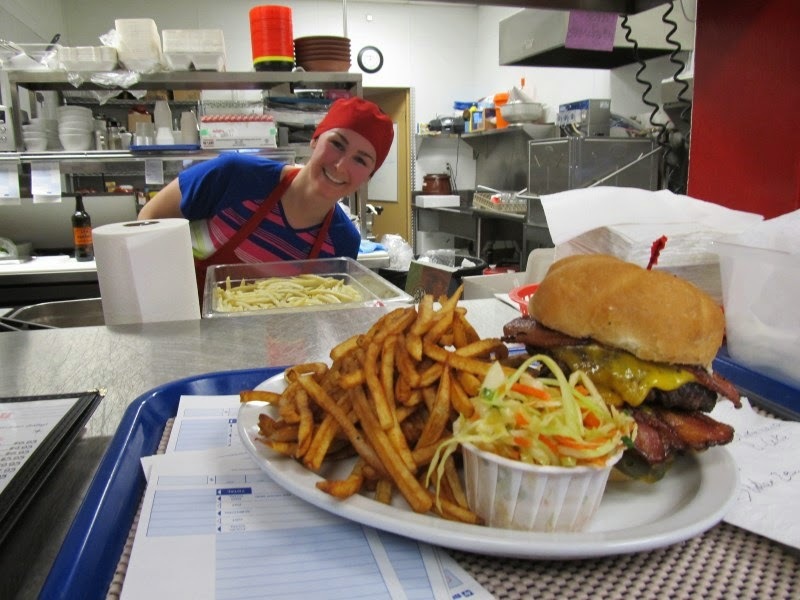 Mark, and our server Diane, both greeted Burger Club warmly. They greet everyone warmly and Mark is very appreciative of his clientele. I'd been to the restaurant when it was the Riviera and remembered how small it was, so I phoned Mark to see if he could accommodate 16 of us. "Sure, I can seat you all, but the fryer can only cook 4 servings at a time." No problem - Diane took our orders as we arrived and the burgers and fries were delivered in waves hot off the grill. There’s no heat lamp – when the food’s ready, it gets served. 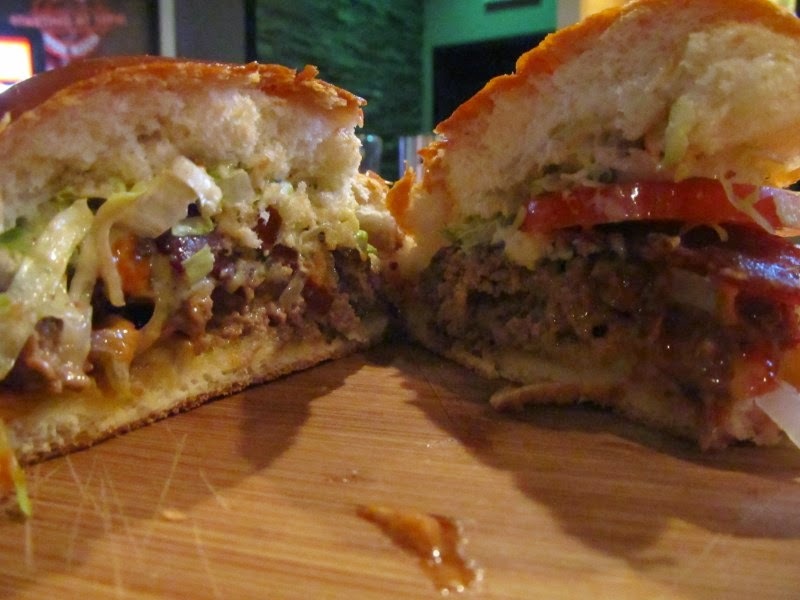 The large patties need a few minutes to cook, but that’s what it takes when eating fresh. Mark took a break from the kitchen to greet us and say a few words about how he locally sources the beef, potatoes and bacon. 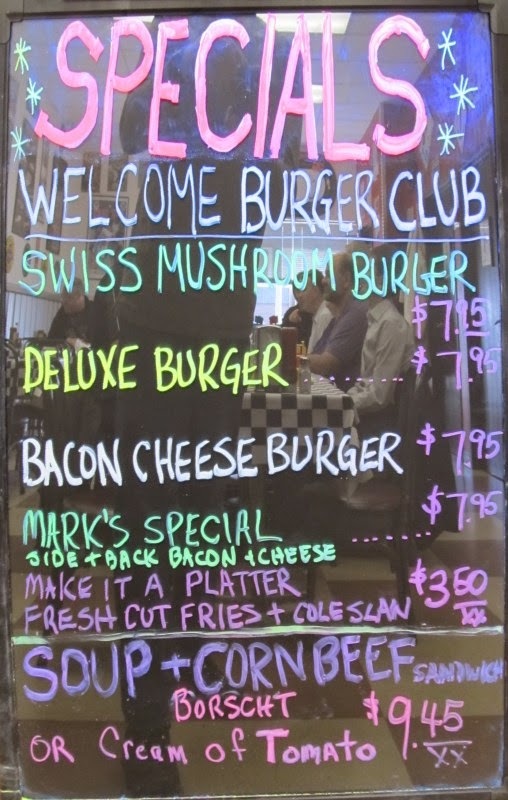 I know right away when Burger Clubber’s had a good time by how much they wrote, and they wrote a lot about Mark’s. Quite a few people ended their review with the words “I'll be back!” High praise indeed. 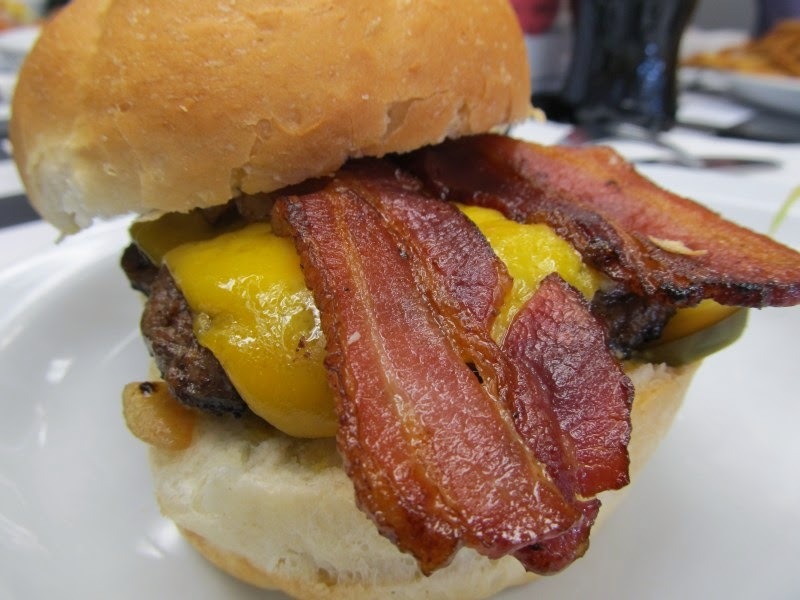 The bacon was the bounty on the burger. There was lots of it, thick and cooked to leathery perfection. 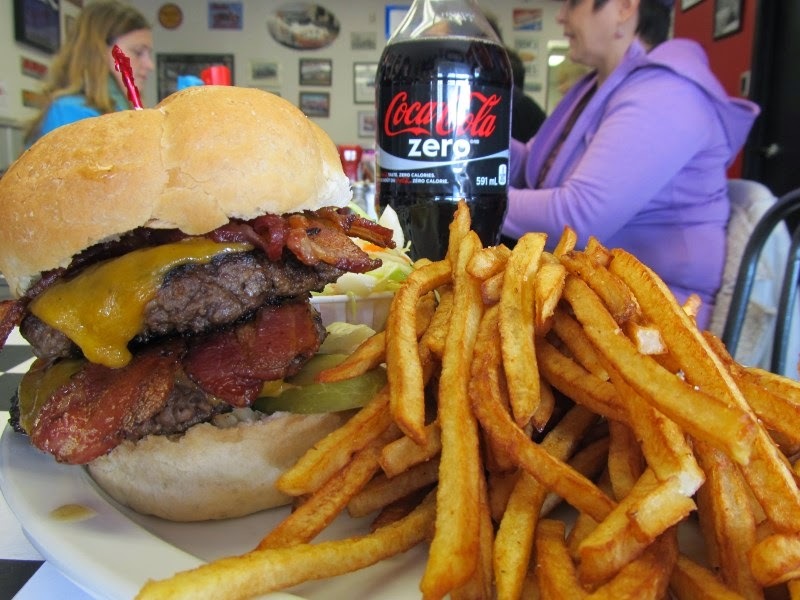 If you go for the Mark’s Special you get side and back bacon. That’s the burger I'm getting next time! Mark’s not shy with the groceries and Deluxe stacks were piled high with iceberg lettuce, tomatoes and a big slice of dill pickle. 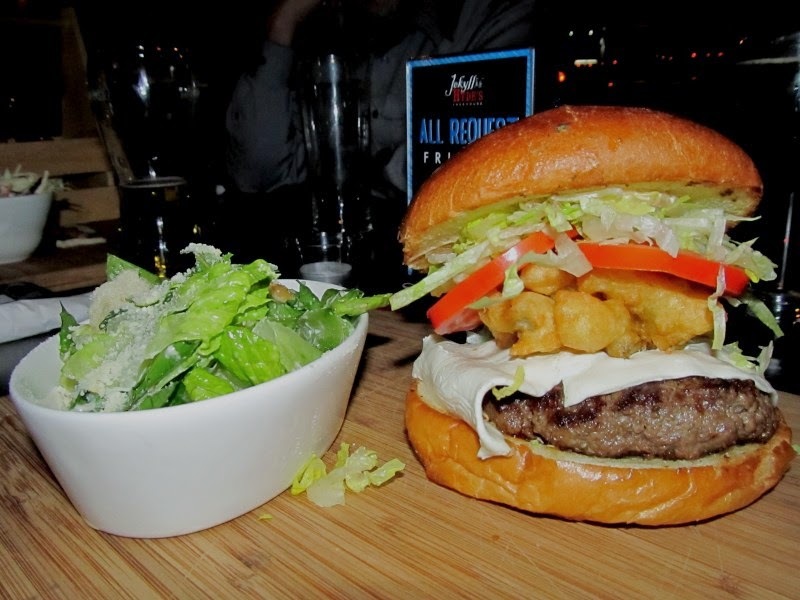 Burgers come with fried or raw onions; I opted for fried and there was a succulent layer nesting the beef patty. I was happy. The soft Kaiser bun did an admirable job of managing the two-hander. Pulling the frilly cocktail stick out of my double beef patty stack was like drawing Excalibur. The fries were shoestring thin, but dark and soft. They were easy to stick a fork in and stuff in my mouth - and there were lots. 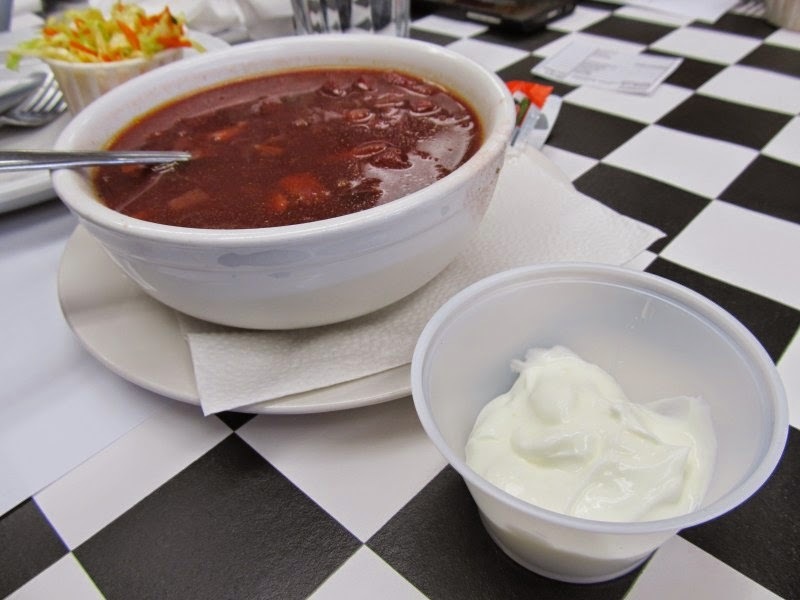 Karen and I shared a big bowl of Borscht with a side serving of sour cream. It was good. Cary brought hats for Burger Club pioneers April and Esther. 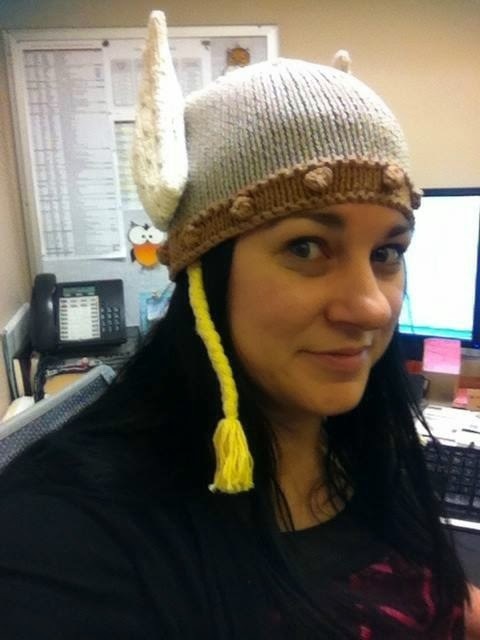 April couldn’t make it this week, but modeled her Winnipeg Roller Derby Valkyries hat when she received it later in the afternoon. 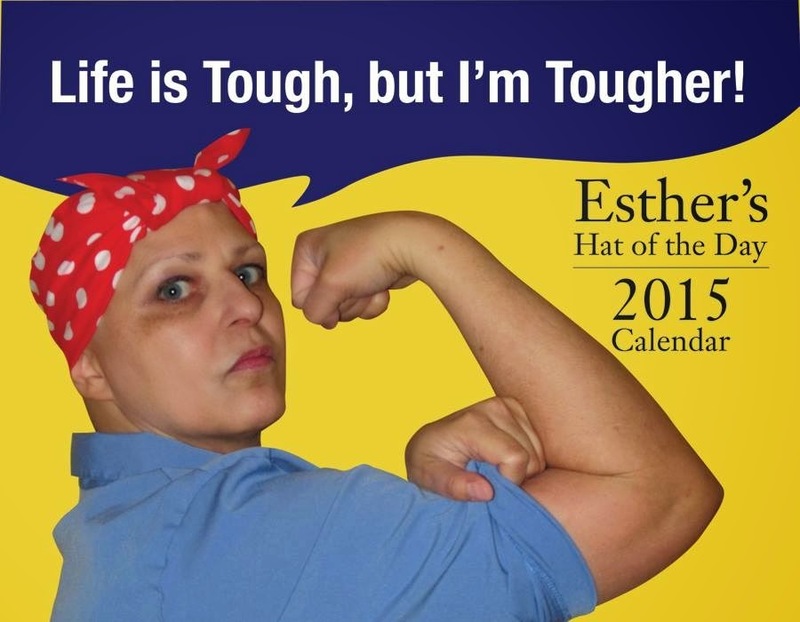 Esther was treated for breast cancer this year and coped with her hair loss by wearing a different Hat of the Day every day. She’s printed a wonderful calendar with over 80 photos and proceeds going to CancerCare Manitoba. They're $15 and you can contact Esther here if you'd like one.